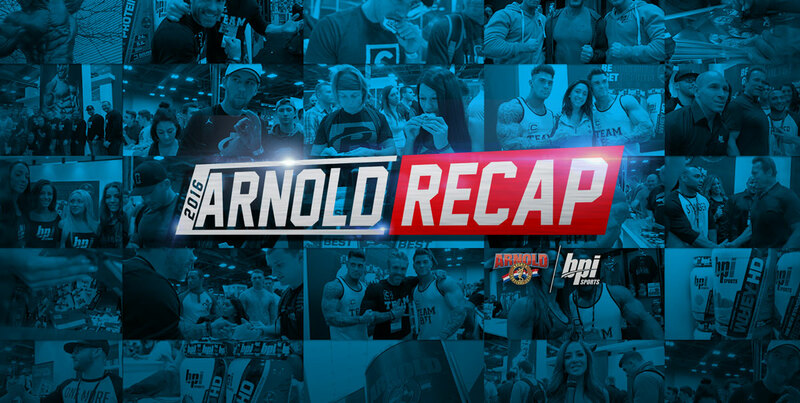 Join BPI Sports athlete Babara Bolotte as she recaps all of the fun and excitement that happened at this year’s Arnold Fitness EXPO at the 2016 Arnold Sports Festival. Thousands of fitness enthusiasts, bodybuilders and BPI Sports fans attended the 2016 Arnold Fitness EXPO. Even fitness celebrities such as Jose Raymond, four times Mr. Olympia Jay Cutler and Mr. Arnold schwarzenegger himself stopped by the BPI Sports booth for a photo op with the team. This year, the Arnold Fitness EXPO in Columbus Ohio was extra special for BPI Sports since we unveiled a new product to join our line of premium supplements.That’s right, we chose this three-day event at booth #1625 to offer free samples of BEST PROTEIN BAR™ to attendees. And the fans have spoken, everyone liked our newest protein bar, especially the cookies and cream flavor. Fitness enthusiasts called the BEST PROTEIN BAR™ soft, chewy and delicious! It packs 20grams of protein and has zero trans fat. To add to all that excitement and energy, BPI Sports co-founder James Grage was proudly signing autographs, while UK fitness celebrities, the Harrison Twins Lewis and Owen, met with fans, took pictures and shared fitness tips. Our most popular supplements were proudly displayed including BEST BCAA™, BEST AMINO w/ENERGY™ and ISO HD™ protein powder. The 2016 Arnold Fitness EXPO was a real success and team BPI Sports is looking forward to next year’s show.